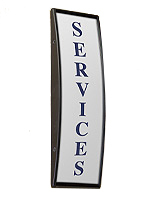 This Quality Sign Supply For Sale Is A Great Addition to Any Office! This Sign Supply May Be Purchased With Confidence From Our Fast Ship Warehouse! 4" x 5.5" 4.5" x 24" 5.5" x 6" 5.5" x 9" 5.5" x 15" 6" x 7.5" 6" x 8.5" 7.5" x 10" 7.5" x 11.75" 8.5" x 11" 8.5" x 16.5" 11.5" x 17"
Looking where to buy sign supplies for business signage? Look no further! 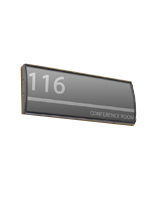 This directional signholder, sign supply is an ideal addition to any workplace or institution. Each wall sign includes a non-glare lens to stop the prints from getting ruined, and for an easy view from all directions. 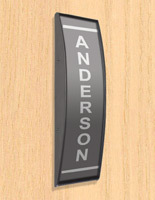 This name holding device, sign supply also enables fast and simple artwork changes. Printed images are replaced by detaching the lens with the supplied suction cup. Despite the fact that images are not supplied with this merchandise, clients can effortlessly create their own prints with their own printer. Sold at an inexpensive cost, clients can even order numerous wayfinding sign supplies to make foyer directories for clients to find their way to the preferred area. This kind of signholder is often discovered inside of law companies, colleges, studios, hospitals, and more. 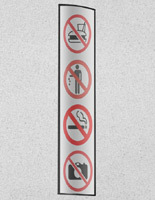 This unique sign supply used for informing people is an appealing method of relaying pertinent facts, as well as room numbers, employee names, warning signage or directories. Fabricated from an anodized aluminum extrusion with acrylic end caps, this aluminum frame can match with any environment it is located in. 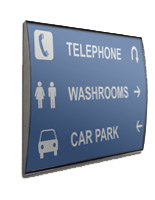 This sign supply, also recognized as a directional sign system, are effortlessly affixed to a wall or door utilizing the supplied double-sided VHB (very high bond) tape. 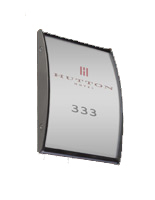 The directory signholder is affixed to the wall in either upright or horizontal orientation. The curved design helps your displayed posters "pop."